Rita Trichur is an award-winning journalist. 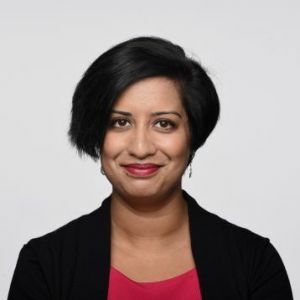 She is the Financial Services Editor for The Globe and Mail and a Canadian business columnist for the Report on Business Magazine. Rita returned to Globe in July 2016 after spending about 2 ½ years as a reporter for The Wall Street Journal’s Canada bureau. She primarily covered domestic banks and insurance companies from Toronto, but also wrote a variety of other stories about Canada for the U.S. newspaper. Prior to WSJ, Rita spent more than three years at the Globe, initially working as a general assignment reporter in the Report on Business before covering the telecom beat. Rita has also covered financial services and economics for the Toronto Star, and has held various roles at the Canadian Press and the Ottawa Sun. She has a Bachelor of Journalism and Political Science and a M.A. in Canadian Studies – both from Carleton University in Ottawa.